Each step makes sure that you share information about yourself that will make your essay effective and help you stand out from the competition. What makes an essay effective? Yup. Just those three steps. If you can write several paragraphs on each of these topics, and present your essay in this general order, you will have a solid college application essay. To learn how to develop each step—and flesh it out into cohesive ideas and paragraphs—click on the underscored links to find and read related posts on each topic. Start by finding one of your defining qualities or characteristics, or a core value. Then brainstorm a moment or incident from your recent past that illustrates the one quality, characteristic or value. Make sure that moment or incident involves some type of problem. Craft that moment into an anecdote, which means you recreate that real-life mini-story using fiction-like language. Include how that moment or incident made you feel. Provide background to that moment or incident; give it context. Share the steps you took to deal with, manage or solve it. Reflect on what inspired you to deal with the problem. Explain what you learned in the process of dealing with that problem. Weave in other examples from your life where you have applied what your learned. Express how you envision applying what you learned in your future endeavors. Some students do a great job sharing a personal story, but spend too much of their essay on those details. Make sure at least half or more of your essay explores Step Two and Step Three. So that’s it. Easy peasy. Now, you can either get cranking and learn how to crank out all these steps, or read on to see exactly how and why this approach works. If you include Step One in your essay, you will give it a sharp focus by only showcasing one defining quality or core value (and you avoid one of the worse essay pitfalls: listing accomplishments and activities and writing a general, dull essay). And you will make sure your essay is engaging at the start by using an anecdote. You will ensure it’s personal by including a real-life story and sharing your feelings. As long as your anecdote or personal story includes some type of problem, you will show your grit. Above all, your essay will be engaging and memorable! If you include Step Two in your essay, you will make sure to reveal how you think and reason and what you value when you share what you thought about and how you handled your problem. When you go on to analyze and evaluate what you learned in the process, you will showcase what you care about and value, as well as your ability to learn and grow. If you include Step Three in your essay, you will reveal how you are able to take a life lesson beyond how it affected you, as well as your ability to think critically and reflectively. If you include other examples from your life where you applied this life lesson, you will naturally share other specific parts of your life. If you express how you intend to use what you learned in your future goals and dreams, you will present yourself as someone who is forward-thinking, ambitious and idealistic. Above all, your essay will be meaningful and memorable! See how all that works so perfectly, simply by following those three steps? The best news is that you can develop each step by reading the related blog posts (the blue links), and within a couple hours of reading and writing, crank our your own killer college application essay. Want to be Likable? Here’s how. Thanks for sharing so much wonderful info. We’d like to know if you’re available for a private session sometime soon as our son could still use some one on one writing his personal statement. He has begun the process but needs help narrowing down the topic or perhaps finding another one. Hi Adele, I do tutor students on essays. Please check out the Services page of my web site for details. You can contact me directly by sending me an email at: EssayHell@gmail.com. My name is Janine Robinson. Thanks! 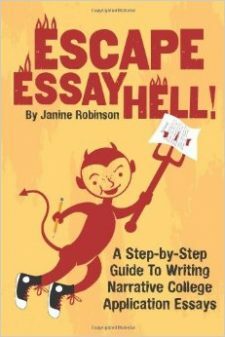 Around this time last year I read a couple common app essay articles on essayhell.com much like this one, and they really helped me write a good essay when I was freaking out about Early Action applications. Honestly, I wish this article had been around a year ago since the advice is even more helpful, but I appreciate the work you did and continue to do. Thankfully, the whole process worked out for me, and I’m now offering my own advice along with some of my friends on our own website. Thanks for all of the help. Keep it up. Thank you so much for sharing your knowledge! I’m a college admission coach in Houston, and I definitely agree with your advice – I especially agree with the importance of getting personal. I am always trying out different ways to get my students to open up and be more self-reflective. Thanks again for sharing! When I found essay hell, it was a delight for me to be able to find a resource that could help push me to write about a topic. This and looking at example essays helped me spur my own essay, and I really appreciate that you provide this free service for students. Thank you very much! I was also wondering if you could help me on another matter. I am writing about my identity as an Indian, the kinds of stereotypes that come up, and how I have countered the stereotype. I am having a bit of trouble, however, on trying to get step 3 in. I think I might want to talk about how I could defend other parts that make up my identity, but I am struggling a little bit. I don’t want to be told of the content that makes this up as I wish to write from my heart. However, any information that could give me a little push would be much appreciated!